SUAKOKO, LIBERIA - OCTOBER 12, 2014: Daniel Korha, 36, who works in the laundry, from Foya in Lofa County, poses for a portrait at the Bong County Ebola Treatment Unit on October 12, 2014 in Suakoko near Gbarnga in Bong County, Liberia. "I lost one of my nephews. At the time, to be very frank, we did not believe that Ebola existed, so we were doing things with that ignorance. He did not even go to a medical center. 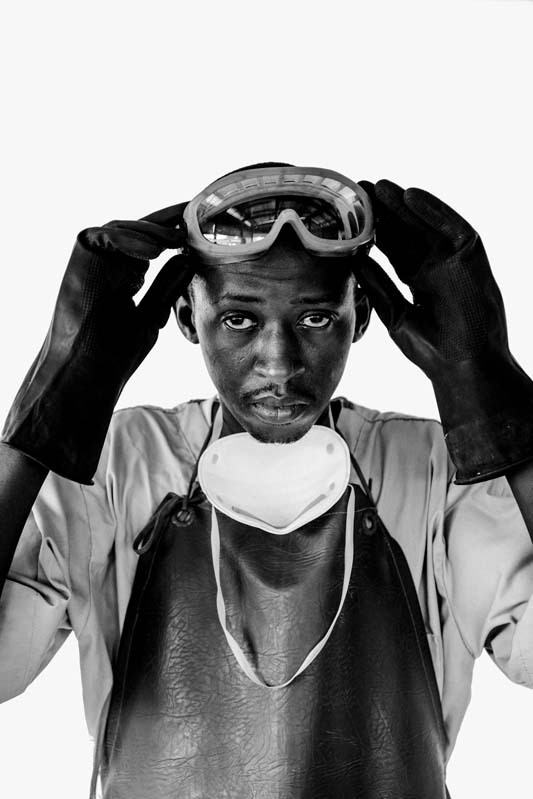 I took this job to join the process of fighting Ebola in Liberia. I feel happy rendering my services to my own people. And I feel happy when they are becoming cured from this Ebola unit. I feel proud." In addition to his nephew, several other members of Mr. Korha's family have died from Ebola. Previously, he built roads and bridges. His involvement with the clinic started before it began operating; he was on a construction training course that was canceled because of the outbreak, and he helped build the clinic instead.